This article was originally posted  on SustainableBrands.com. We rarely realize it, but language is the lens through which we form perceptions about people, places and products. From my involvement in corporate marketing, I know that companies and advertisers are keenly aware of language’s power for consumers. Marketing specialists pore over focus group data and behavior studies to understand what makes consumers tick, carefully selecting words to evoke emotions, motivate us and shape our tastes. The right phrasing can make a world of difference. Can the same sort of creative turn of phrase advance foods that are healthier for people and the planet? We know that current agricultural patterns are leading to rampant deforestation, strained water sources and a warming planet. Over the past 50 years, agricultural land has expanded by roughly 500 million hectares (1.2 billion acres), and more than 75 percent of that is used to produce just meat and dairy. As incomes rise in emerging economies and more people adopt Western-style diets, precious natural resources will be squeezed even further. That is, unless we change what we eat. 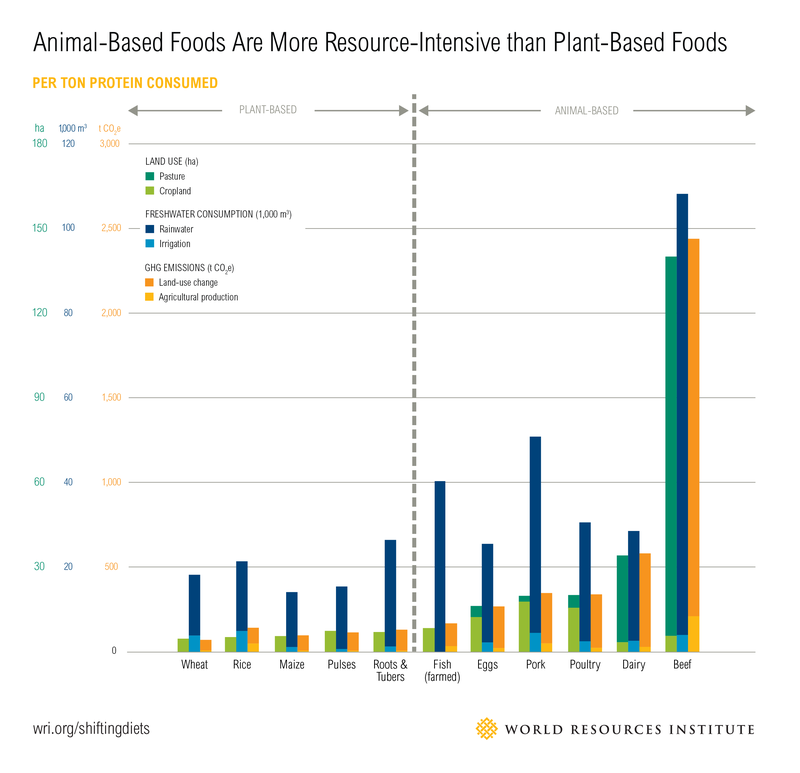 Recent research from WRI, Shifting Diets for a Sustainable Food Future , found that shifting more people toward diets rich in plant-based foods  can significantly reduce greenhouse gas emissions and help close a 70 percent gap in the amount of food available today and that to feed a growing population. And yet, the current terminology used to describe plant-based dining options is less than appetizing. Early research shows that consumers are cold to phrases such as “vegetarian” and “vegan.” That’s in part because of social perceptions about those who identify as plant-based eaters. Studies  have found that followers of plant-based diets are perceived to be more virtuous, moral, attractive and intelligent than omnivores — but they are also seen as boring, serious and less fun to be around. Who wants to be the bore at the dinner party? Even foods described as “healthy” can, on certain eating occasions , be a turn-off. During celebrations or social occasions, taste and indulgence steer our food decisions, and many consumers expect a healthy dining experience to be less enjoyable, less tasty and less filling . Using health-based messaging alone is further complicated because many consumers already believe they are in good or excellent health . There are promising efforts underway, though. In London, a group of marketing experts recently launched the #VegCurious campaign , targeting young men who historically have been vegetable-averse but are part of the millennial generation that shows more openness to different ways of eating. The advertising showed muscled men bench-pressing broccoli, countering the stereotype that “real men” eat more meat  and using humor  to attract new audiences. What these campaigns show is a hunger for new ways to approach consumers about plant-based foods . Unlike the beer industry, there’s little consistency across the food industry in how we talk with consumers about plant-based foods and the benefits that should make them desirable. The challenge is clear: The planet cannot sustain current consumption trends much longer, so we have to overcome the linguistic hurdles faced by plant-based eating. There’s no denying that words have power. With the right kind of evolution in language, food industry leaders and the environmental community can redefine how diners experience foods that are plant-based and better for the environment. We can create the kind of step change that’s urgently needed. What would your campaign to promote plant-based diets sound like?